From defending Trump's 'Muslim ban' to backing the hard-right group behind 'Londonistan' posters...is it time Farage resigned membership of the Farage Party? After over a decade in the party, Nigel Farage has ditched the UK Independence Party, apparently over its far-right shift under leader Gerrard Batten. Or at least, that’s the story most of the papers are lapping up. Batten – who has called Islam a ‘death cult’ – recently appointed ex-English Defence League leader Tommy Robinson as an adviser on ‘grooming gangs’. Farage told LBC he did not recognise the party anymore, which is now ‘obsessed’ with Islam. That it was was turning a blind eye to extremist politics. Which is funny, coming from Nigel Farage. He might want to resign from himself after being guilty of the same thing. Here’s just some of the times he ‘obsessed’ over Islam. The MEP said the EU was in for a ‘bigger shock’ than the Brexit vote due to a backlash against Muslim immigration. In the wake of the Paris attacks, Farage said Muslims were ‘conflicted in their loyalties’ between the UK and their religion. He demanded a battle for ‘hearts and minds’ within the Muslim population and warned of ‘tremendous conflict’. 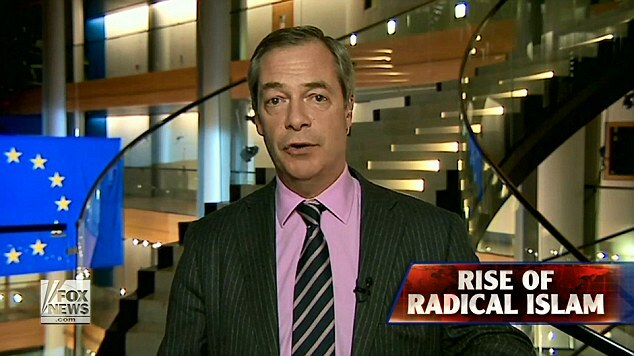 “There are gangs of men out saying to women in short dresses there shouldn’t be there; to people in having a drink that they shouldn’t be there,” Farage told riled-up Fox News viewers in June last year. Of course, there was no one challenging him to back up his claims. He also used the slot as a chance to attack London Mayor Sadiq Khan and argue London is full of ‘wholly Muslim areas’. In April this year, the Leave.EU campaign that Nigel Farage explicitly endorsed tweeted an image of ‘Londonistan’ – next to a picture of Sadiq Khan. The group deleted the tweet – but carried on defending the post. “As for the Muslim issue, no-one is allowed to talk about it and won’t for fear of being labelled racist by the likes of him [Wes Streeting],” a Leave.EU spokesperson told the BBC’s Newsbeat. They hit out in a still-live statement at the widely respected anti-Islamophobia monitoring group Tell MAMA. Did Nigel Farage criticise his former pals? Fat chance: there wasn’t political capital to be made from it.